Probiotic bacteria, red beets and biologically active B12 as methylcobalamin. Studies have shown that probiotic bacteria increase absorption. Vitamin B12 (cobalamin) was first discovered in 1948. It is a very large, complex molecule that the body needs to develop all types of cells. Nerve cells especially suffer from vitamin B12 deficiency. The biological activity of methylcobalamin is increased with probiotic bacteria,red beets and BioPerine®. BioPerine® increases absorption through thermogenesis. Thermogenesis activates the mechanisms that improve digestion, helping the body absorb nutrients more effectively. BioPerine® has a positive effect on digestion, which makes you feel good. BioPerine® improves the body's own, natural thermogenic activities, so it can be described as a thermo-nutrient. It is crucial that vegetarians who do not consume milk and eggs make sure they are getting enough vitamin B12. Contents: 90 VegeCaps each containing 7.5µ biologically active B12 and 5mg BioPerine®. A must for vegetarians Vitamin B12 supports: The formation of blood sells, energy metabolism, normal neurological and physical function. The daily reference value is only 2.5µ (µ = micrograms or millionth gram) = 0.000'002'5 grams. That is 0.075g less over the entire course of a person's life than the weight of a kernel of grain. But it is still enough to supply all of our body's cells with enough essential vitamin B12. Like vitamin D, vitamin B12 is only found in animal products like meat, milk and cheese. Our body does not produce it itself. Vitamin B12 (cobalamin) is a complex molecule with a cobalt atom at its center. Its structure is similar to the hemoglobin (blood pigment) molecule, which has an iron atom at its center. Cobalamin is a chemical compound that is found in all living organisms. Its most important form is coenzyme B12, the biologically active form of vitamin B12, which can be found in several enzymes as a co-factor (coenzyme). The human body does not produce vitamin B12, which is why it relies on our diet as a source of the vitamin. 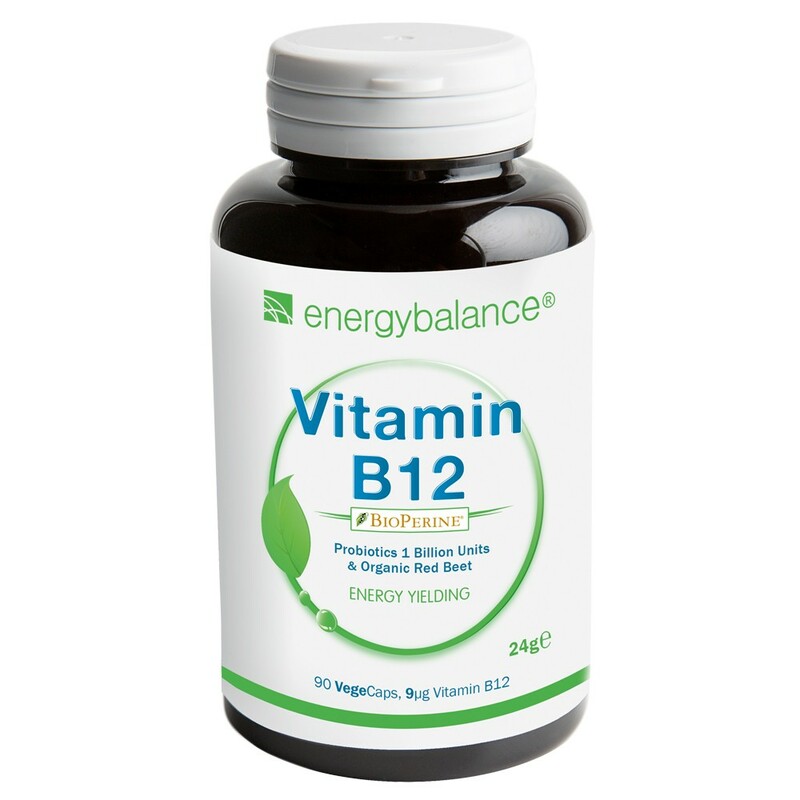 Only certain microorganisms are capable of producing vitamin B12. Even though these bacteria are present in the intestinal flora, the vitamin B12 they produce is not enough to meet our daily requirements. That's why it is crucial that vegetarians who do not eat milk or eggs make sure they get enough vitamin B12. BioPerine® is an alkaloid, an organic alkaline compound containing nitrogen. The metabolic process that creates energy in the cells of the human body is called thermogenesis. Thermogenesis has proven to be a key factor in weight loss. Recent findings show that it plays an important role in how the body processes our daily food and nutritional needs. Thermogenesis activates the mechanisms that improve digestion, helping the body absorb nutrients more effectively. BioPerine® has a positive effect on digestion, which makes you feel good. BioPerine® improves the body's own, natural thermogenic activities, so it can be described as a thermo-nutrient. BioPerine® increases bioavailability, or absorption, of different nutrients. Read more about it in the encyclopedia.